To get the most out of Barcelona and all its glory you need to be in the know on the places to visit. Sure, you can go to all the most popular and touristy spots and see the side of Barcelona that the whole world knows, but you could also visit the city like a local would and get to know its real charm. Now that summer is approaching and with that, the high season, parks are starting to get very very busy around Barcelona. But if you want a more relaxed and quiet visit to a park we suggest you avoid Ciutadella as well as Park Güell! Instead, check out some of the more hidden green paradises throughout the city. Parc del Laberint d’Horta is a historical, 18th century park with a maze and pavilion. It’s the oldest garden in Barcelona and has no match in the city for its artistic landscaping. Wander round and discover all the hidden corners and mythological sculptures. Another gem is El Jardí Botànic, situated right next to the castle at the top of Montjuïc Hill. It houses vegetation from the five regions of the world including a Mediterranean garden and a pond. You can also get great views of the city from up here. Even more off the beaten track are the Tamarita Gardens in the upmarket neighbourhood of Sant Gervasi. They used to be private gardens for the two-hectare estate its on but since, have been opened for the public. The gardens are full of decorative features that show their origins as a house such as small pools, ornamental flower vases and terracotta figures. It’s the ideal place if you want some peace and quiet from the restlessness of the city. It goes without saying that a trip to Barcelona is not complete without visiting the beach. 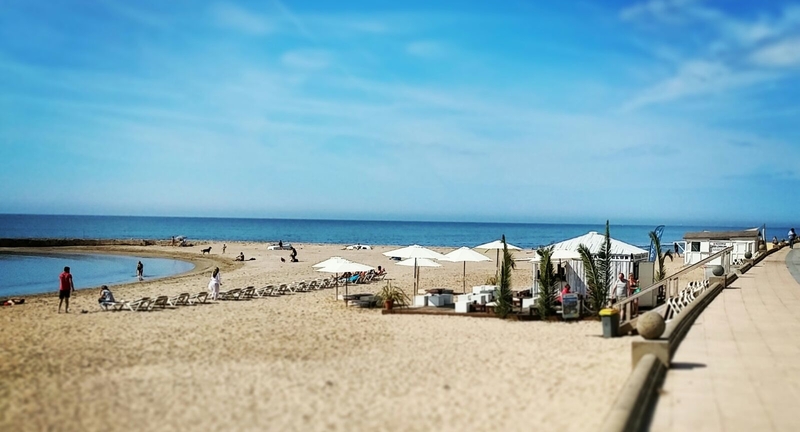 The most popular beach is of course is Barceloneta, but don’t be fooled! It is a tourist hot-spot full to the brim in summer. For a more pleasant experience without people trying to sell you badly-made mojitos the colour of toxic waste every five minutes then pay close attention to our advice. Just one more stop on the metro takes you to some lesser-known beaches like Llevant and Mar Bella. On the yellow metro line, get out at Ciutadella X Vila Olímpica and walk down towards the beach to where all the big clubs are like Pacha and Catwalk. To the right is the main beach of Barceloneta so you want to go left instead, away from the craziness. Keep going past Port Olímpico and the first beach, then you’ll arrive at Llevant. If you want even more peace and quiet, keep going to the next couple of beaches and you’ll find the Mar Bella beaches. Now you know the insiders secret, don’t go shouting about it! Spain’s plazas dominate its cities. It’s a characteristic hard to ignore with at least one main plaza in each city as well as little ones that you’ll stumble across walking round. They are large open spaces generally placed in residential areas dotted around the city. One of the most beautiful plazas in Barcelona is Plaça Reial in the Gothic Quarter – its aristocratic buildings surrounding the plaza bring a certain grandeur together with the towering palm trees. It’s the perfect setting for sipping on cocktails (albeit expensive) under the sun. 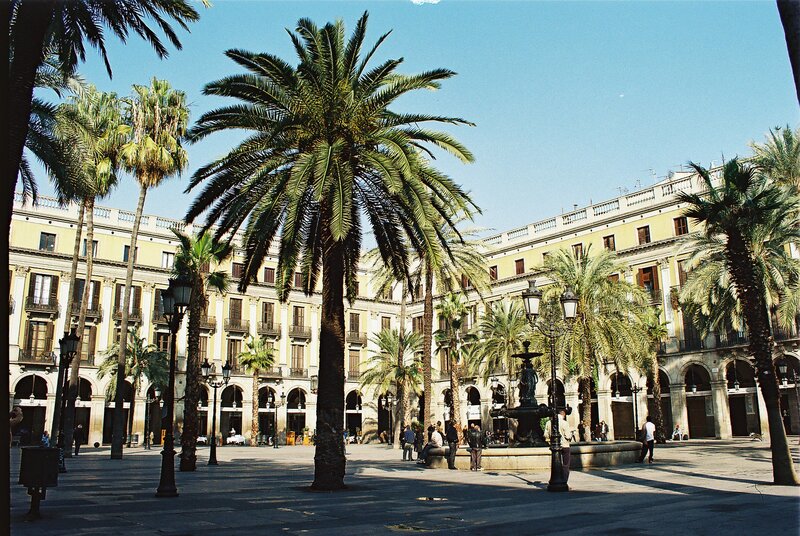 Plaça Reial is touristy but its just too beautiful to leave off the list. 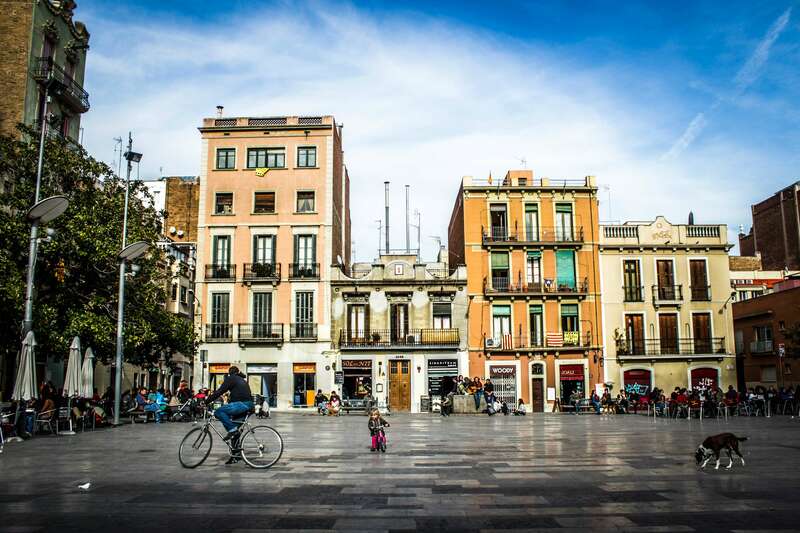 Vila de Gràcia is a neighbourhood of Barcelona that used to be a separate village before the expansion of the city. Today, it still feels like its own entity with its own character too. In fact, on meeting someone who grew up in Gràcia, they will most likely be sure to state that they are in fact from Gràcia and not Barcelona. The Vila de Gràcia has many quaint squares with a very residential vibe so you really feel like you’re seeing the real side of the city. Plaça de la Vila de Gràcia is the main square of the area. Visit around lunchtime to find some very cheap lunch menus from €9 for three courses. Plaça del Sol, also in Gràcia, has a certain quirk to it. In the late afternoon towards the evening, locals gather in the masses to sit down and enjoy a few beers in circles with their friends. Because of the low buildings surrounding the plaza, it catches the sun for a good portion of the day into the evening. The district of El Born in the old part of the city also makes for a pleasant stroll around open squares. 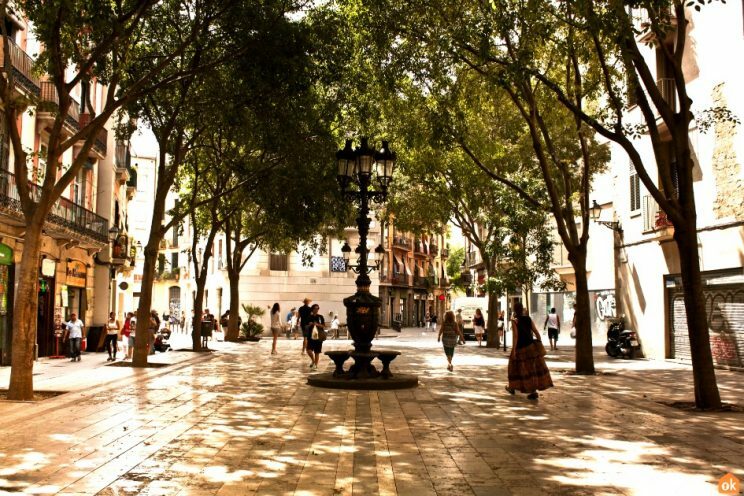 Plaça de Sant Augusti Vell is situated on the edge of El Born and surround by apartments and little cafés to enjoy. Now that you have our insiders tips for exploring the city in the fresh air, add these to your itinerary and hold on for our next edition of local tips: eating, drinking and shopping in Barcelona. Do you have any tips to add about the lesser known places to see in the city? Tweet us at @FusterApartment, we’d love to hear them!